Congratulations ! The original artwork is available for purchase for $8511.80 shipping included. You will be able to review this purchase in the subsequent screens. If you have a question, please email support@pastelspace.com. Purchase 1200 x 1216 pixel digital file by using the Buy Now buttons below. You will receive an email with the download link. You can use the link 5 times to download the digital file. 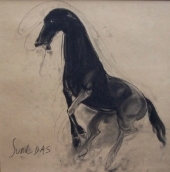 Artist Sunil Das' Stallion is a work that truly captures strength, grace, agility and motion in a single masterstroke. The artist of this work Sunil Das was an Indian expressionist painter. 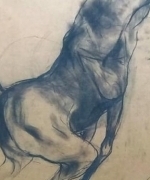 He is known for the paintings in his Bull Series and his piece "Woman". In 2014 the Government of India conferred upon him its fourth-highest civilian award, the Padma Shri. Sunil Das was born in Calcutta, India. 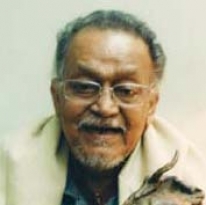 He joined the Government College of Art & Craft, Kolkata in 1955, then won a French Government Scholarship to study at the École des Beaux-Arts in Paris. He died in 2015.